Somehow, I’ve managed to make it to my mid-30s without ever delving into the details of men’s suiting. I am an attorney, but my work has been in the technology sector, and more recently, in city government. In both of these roles, business casual was the order of the day. That is about about to change, however…I recently won the election to the Massachusetts state legislature! While our state is known for its great liberal leaders—people like John F. Kennedy, Michael Dukakis, and Elizabeth Warren—the dress code on Beacon Hill is decidedly conservative. Indeed, the only respectable attire for State House business is a suit—and as a really big and really tall guy (6’8″ to be exact), this fact has had me feeling more than a little anxious. I’ve always owned suits, but I have never really thought too much about style, fit, or the details of the suits I wear. 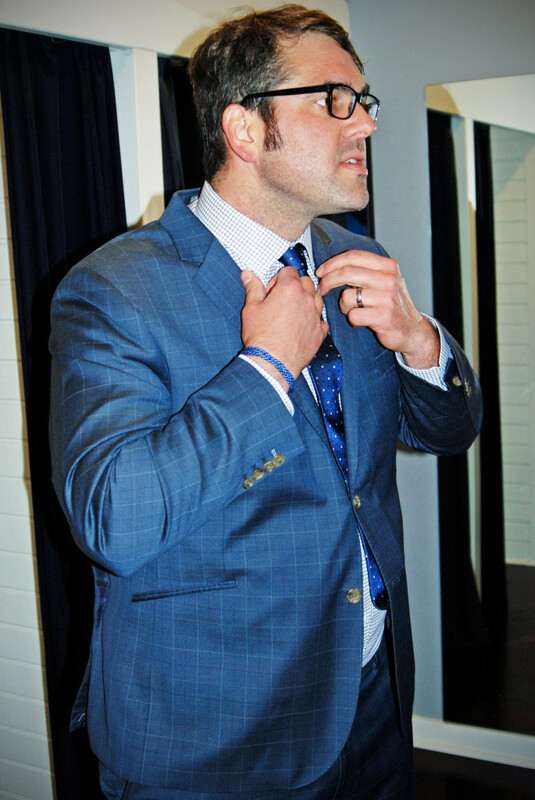 About once a year, almost always before a special occasion or a big professional event, I’ll dash into the local Men’s Wearhouse—and given my former-football-player’s-frame—I consider myself lucky to walk out with anything that sort of fits. In short, I’ve always been willing to settle for whatever I can find. To overcome all my sartorial fears, I teamed up with The Height of Style to schedule a consultation with Victoria Perez of Indochino, a “made to measure” line of menswear with showrooms in Toronto, Vancouver, New York, San Francisco, Philadelphia, Beverly Hills, and Boston. 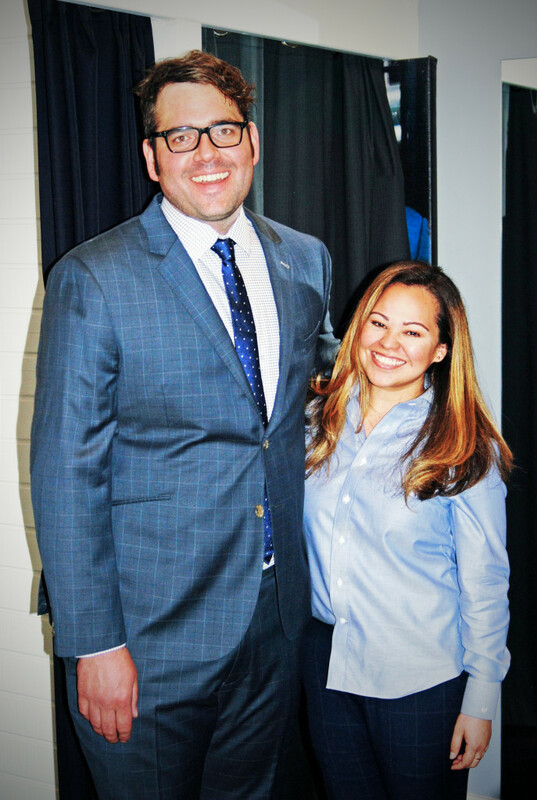 I met with Victoria on a fall afternoon at Indochino’s showroom on Boston’s Newbury Street, and she told me more about the company’s mission and explained the custom fitting process. 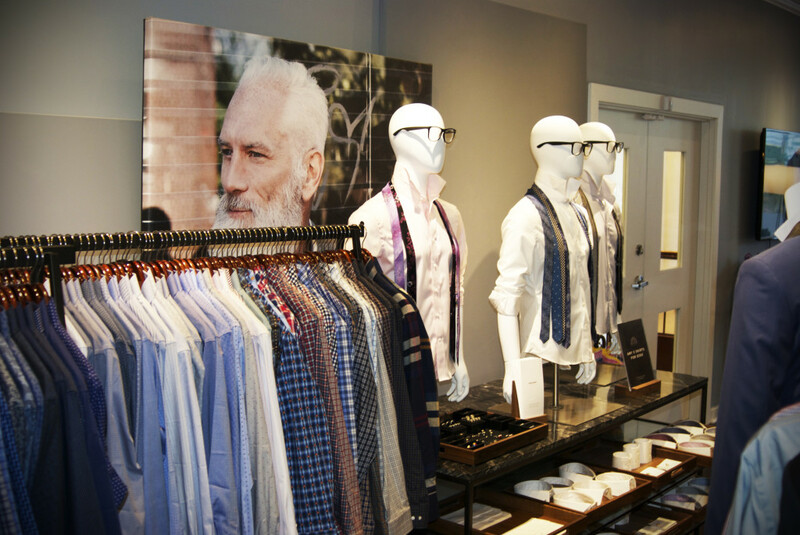 Indochino prides itself for being “at the forefront of revolutionizing men’s fashion”. Sounded great to me, as my wardrobe most certainly could use some “revolution”! The process started with Victoria taking a series of 14 body measurements. 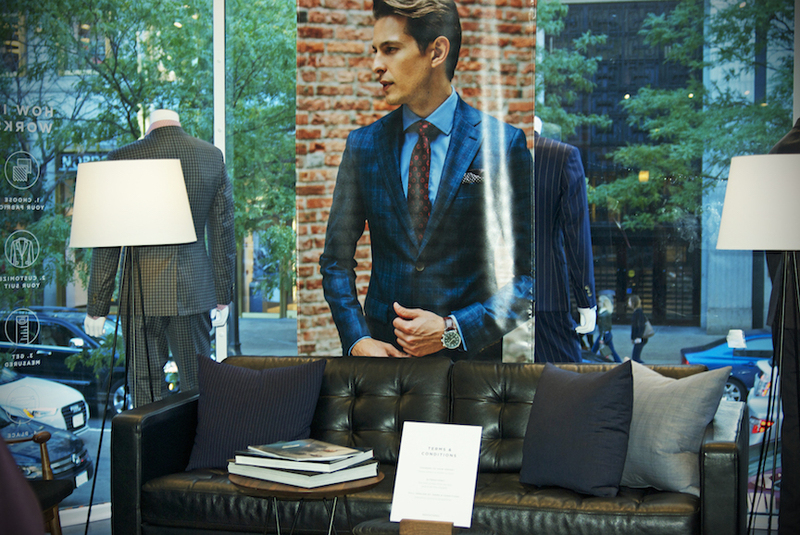 All of the data from these measurements is entered into Indochino’s digital form, enabling the production of your custom-sized suit. (If you don’t live near a showroom, don’t worry: this video will guide you through all the steps of taking measurements from home.) And by the way—your measurements will be saved to streamline future ordering. With the measurements out of the way, the real fun was about to begin as I determined the look of the suit I was going for. Victoria was invaluable here—she’s knowledgeable about all the details that make a suit look modern (from cut to fabric choices). She expertly guided me through a variety of options, starting with fabric. After looking through the array, I chose the handsome “dark slate check” fabric—a subtle plaid somewhere between a charcoal gray and a navy blue. Next, I had to decide between a two-piece or a three-piece suit. My first inclination was to keep it simple with just slacks and a jacket. But Victoria pointed out how versatile a vest can be: it adds warmth in the winter, and on hot summer days, it can be worn in place of a jacket for a pulled-together look. 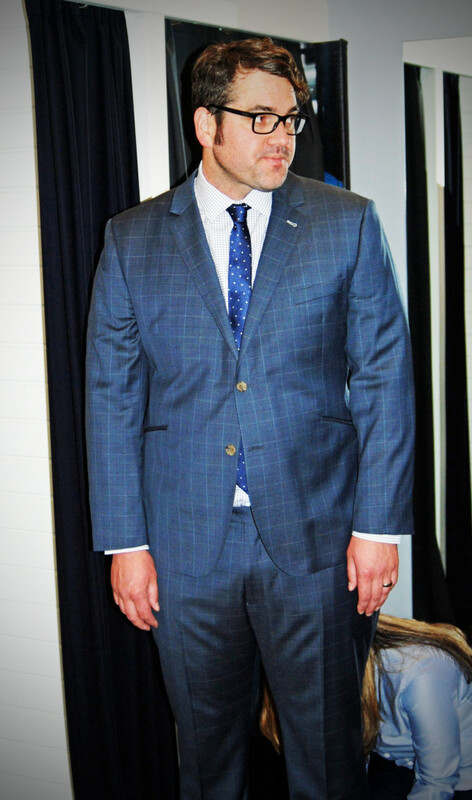 So, I decided to go out on a limb and order my first ever three-piece suit! For the jacket, there were many customization options. Victoria suggested a two-button jacket, which was perfect for allowing the vest to show through. I decided on no pockets because I didn’t want it to feel at all bulky. Instead, I choose slanted flaps to add additional streamlining. 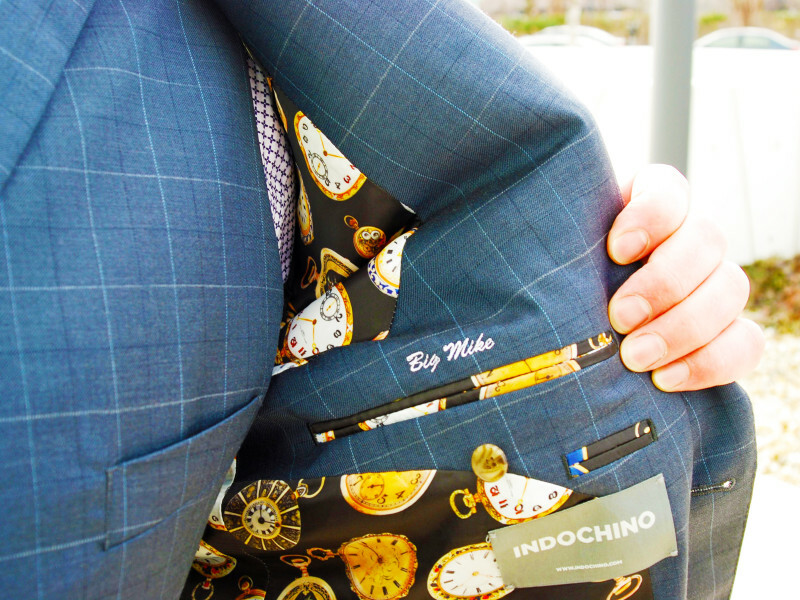 On the inside of the coat, I was able to choose the “black pocket watch” lining—I was really getting into the process by then, and added a custom “Big Mike” monogram on the inside of the coat. For the pants, I chose not to have pleats or cuffs; Victoria recommended the pants be more fitted, and I’m glad she did. I also added on belt loops (of course! ), but declined the suspender buttons. I lined my five button vest with the “black pocket watch” fabric, and then picked a shirt— Victoria took me through all of the different shirt styles (I really had no idea there were so many different types of collars) and I chose a “spread collar”. For the shirt’s cuffs, I selected “one button angled”. Last but not least, I needed to tie it all together. I considered a variety of options, but settled on a “navy blue white dot” tie. Every step of the way, I leaned on Victoria for her expert advice. She did a great job of allowing me to explore my own tastes while still making sure that I steered clear of any disasters. Within seconds of exiting the showroom, an email arrived that included a detailed summary of my order. 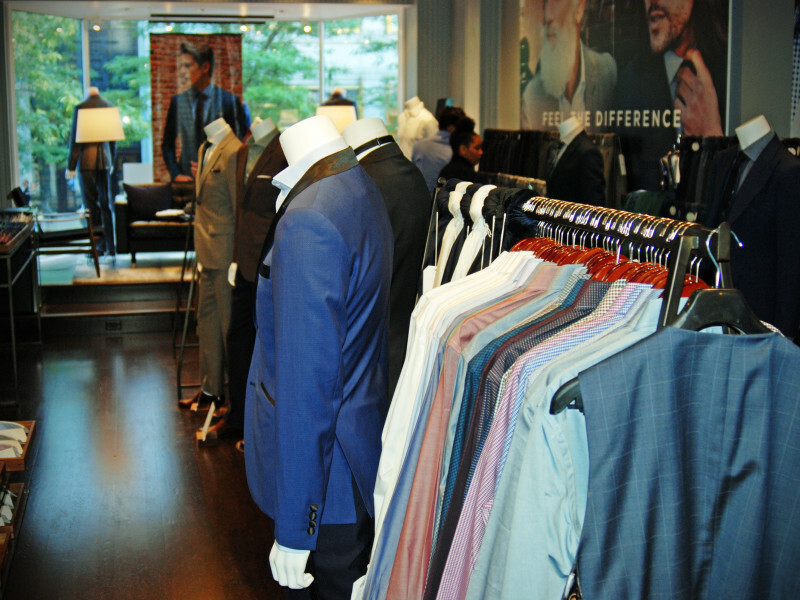 Customers have 24 hours to review their selections before the suit goes into production. 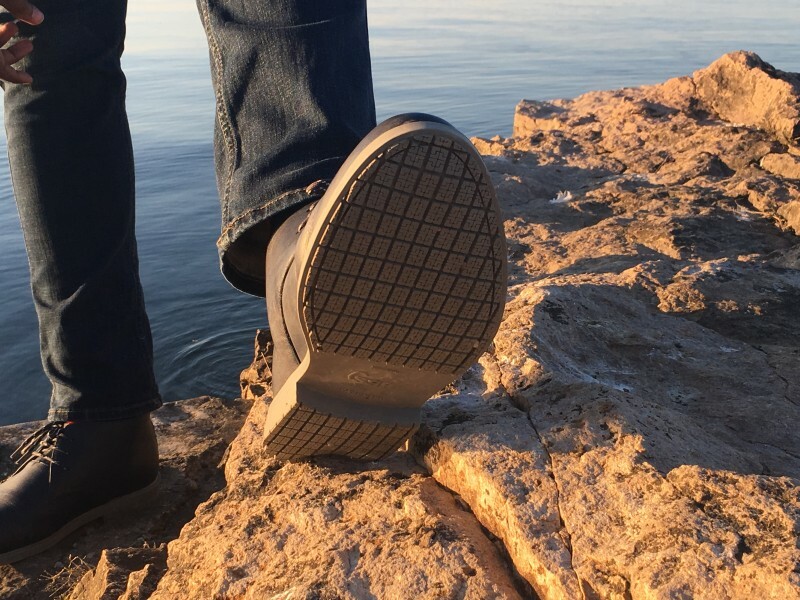 I thought this was a great aspect of the fitting process, as it gave me the opportunity to share all my choices with Kacy (my wife, and THOS founder/editor-in-chief). Kacy liked how it all looked, so I sent a thank you note off to Victoria and started counting down the days (about 4 weeks) until my suit would arrive. 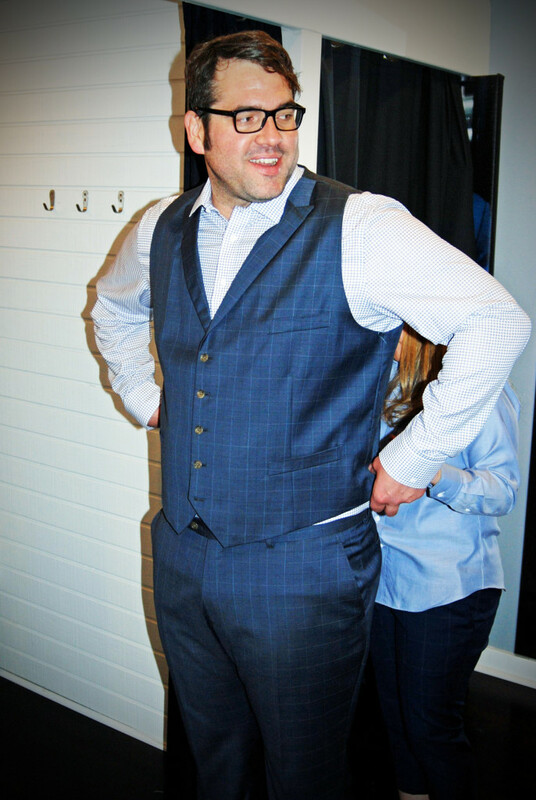 When it did—and I went back for my first fitting (as seen here)—I couldn’t have been more impressed. Coming up next: My review after taking my final-fitted suit out for its first wear. Thanks, Indochino!